Crafted with the same level of attention to detail as other leading Sub-Zero models today, this unique built-in option delivers plenty of interior space in a contemporary counter-depth design. The slim profile melds wonderfully into any modern kitchen, while the adjustable glass shelves and door bins, humidity-controlled crispers and deli drawer combine to create a truly usable interior space. Clients report unmatched reliability and amazing flexibility when integrating this model into a custom kitchen or commercial prep space. 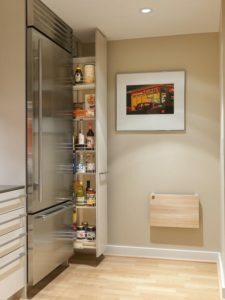 This 36” built-in bottom-freezer refrigerator offers the space, performance and luxurious good looks you’ve come to expect from Sub-Zero, but at a more modest price than you might expect. Custom kitchens are made that much more amazing with the addition of a Sub-Zero appliance!